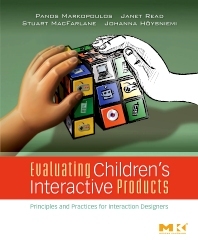 Evaluating Children's Interactive Products directly addresses the need to ensure that interactive products designed for children — whether toys, games, educational products, or websites — are safe, effective, and entertaining. It presents an essential background in child development and child psychology, particularly as they relate to technology; captures best practices for observing and surveying children, training evaluators, and capturing the child user experience using audio and visual technology; and examines ethical and legal issues involved in working with children and offers guidelines for effective risk management. Based on the authors' workshops, conference courses, and own design experience and research, this highly practical book reads like a handbook, while being thoroughly grounded in the latest research. Throughout, the authors illustrate techniques and principles with numerous mini case studies and highlight practical information in tips and exercises and conclude with three in-depth case studies. This book is recommended for usability experts, product developers, and researchers in the field. Presents an essential background in child development and child psychology, particularly as they relate to technology. Captures best practices for observing and surveying children, training evaluators, and capturing the child user experience using audio and visual technology. Examines ethical and legal issues involved in working with children and offers guidelines for effective risk management. Professionals and students who are working on the design of a product whose intended audience is children. This market includes usability experts, product developers of web sites, software--whether games or educational or both--and researchers who are building or evaluating products in the lab for R&D or prototype/projects. Three of the four authors are academics and teach courses on this, and one school, the University of Central Lancashire has a degree program in this area. So there are some limited opportunities for adoptions but there are some.